Netflix shows are nothing compared to real time political thrillers. 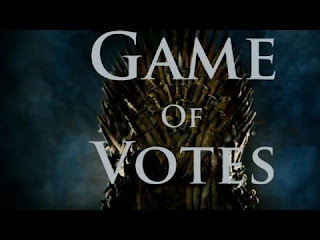 I am binge watching one where the political secretary of Sonia Gandhi is fighting the maneuvers of a ruthless election machine, the BJP. Ahmed Patel. Never heard of him? Well, between 2004 and 2014, when madam held the remote, all buttons were pressed by Patel bhai. Need an appointment? AP. Firefighting? AP. Cabinet reshuffle? AP. Fix Amit Shah? AP. But that was past. Cut to present. Today Patel guy is fighting a nail-biter to retain his parliamentary seat. Initially he had 57 MLAs but after a series of defections and resignations orchestrated by his rivals (read Amit Shah), he is left with 44. And that’s the twist. The old bean has 44 but needs 45. One crucial vote. Will he, won’t he? Never saw Patel look so tense. Almost nervous. Never saw news anchors so excited. Almost animated. But there is more than prestige at stake. In an article, Rajdeep says, Amit Shah and Ahmed Patel are ‘jaani dushmans’. Shah, they say, wants revenge for what he believes is Patel’s role in jailing him in an encounter case. So this is as much personal as it is political. Sannu ki? But, by God it is so entertaining. It’s 7 pm. I continue to flip channels. The EC has not even begun counting. An unverified video shows two disputed votes by Congress MLAs. Worse, one Congress guy out of 44 has cross voted. This upsets Rajdeep more than Patel. If Arnab is unable to hide his excitement, Rajdeep is unable to hide his disappointment. By 9 pm, when the BJP and Congress delegations approach the EC like students approach the Principal, the Congress spokesperson does a Kejriwal and disses the EC anticipating partisanship. In other news, around the same time, China threatens war, says they will enter Kashmir. But our news channels are like, ‘Baad mein dekhenge be! Abhi Ahmed bhai needs one vote.’ To add to the world woes, Trump says if N Korea escalates nuclear threat, it will be met with fire and fury. 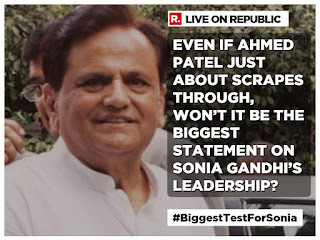 The world is likely to end but the more important thing is that Ahmed Patel’s fate is undecided. Fresh air? When Arnab is extolling me to ‘Fire my views’ who wants fresh air? Around 11.30 pm, the Election Commission invalidates two contentious votes after PC Chidambaram’s legal acumen convinces the returning officer. 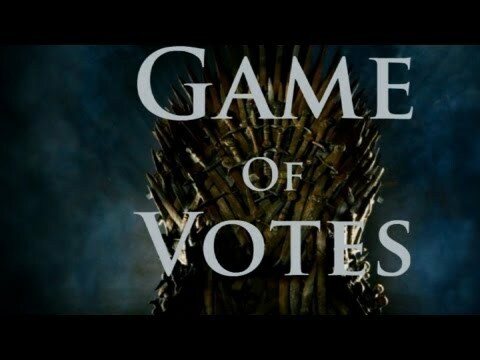 Which means the overall strength of the house is reduced and Patel chap needs only 44 to win. 44, after all, is the magical Congress number. At this point I doze off when I realize that the maid is on a holiday and whatever the result, neither Patel nor Shah will help me do the dishes. And then, much after the stroke of midnight, The Ahmed Patel keeps his tryst with destiny. He is blessed with 43 of his own and one mystery voter. Election Commission saved our democracy but the mystery guy, probably JDUs Chotu Bhai Vasava saved Sonia’s prestige. Yo man! Likely that your ten generations will not have to work. Or pay income tax. Now that the two ‘Jaani Dushmans’ have reached Rajya Sabha, the episode where they face each other will make for a riveting watch. 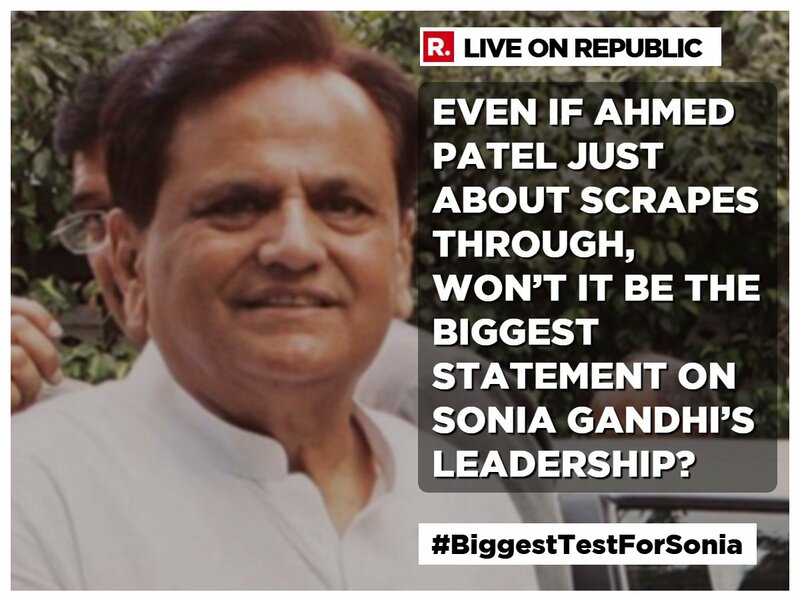 That Ahmed Patel’s desire to win the RS poll could sink Gujarat Congress deserves another season of the Game of Votes. On the personal front, it's clear that I'm a political junkie. Who stays awake all night and wakes up with a headache for one inconsequential election? Exactly why Rekha needs to attend Rajya Sabha more often - to maintain world peace. The men will be so busy gaping at her, they'll forget their Machiavellian moves. Lol, that's a great idea. Ah, there, now I know what all that ruckus Arnab was creating over Ahmed Patel is about. I generally steer clear of all news headlines and keep my brain happily idling over least politically informed channels. But your interpretation of the drama makes me pay attention. Hey, this kissa kursi ka is indeed more interesting than the Game of Thrones! I try to stay clear but end up getting hooked. Meanwhile, our Chinese brethren are bristling with deadly intentions atop the Dokalam plateau. The hallowed Indian Army, hollowed out of decades of neglect and corruption methodically executed by who else than the scourge of this nation called 'Congress' is putting up a brave face up there? 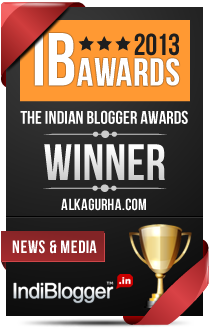 What do we care who makes it to that white elephant called the 'Rajya Sabha'? We may not care but guess it's the ultimate privilege ticket. No one can question you. Power and pelf. What an amazing recap of the fateful event.. thoroughly enjoyed reading this. While India was glued to the tv for this exciting game of vote.. Trump's 'fire and fury' outburst undid the stupendous run of the stock markets the following day. So glad you did, not many enjoy reading political posts. And yet, thank you for stopping by.